Revolution Brewing is celebrating its longstanding partnership with Chicago's Comic & Entertainment Expo by providing fans with a chance to win a Chicago Beer Experience Weekend & C2E2 passes. We're celebrating our 7th year partnering with C2E2 (Chicago Comic & Entertainment Expo) by providing fans with a chance to win the ultimate Chicago Beer Experience Weekend on March 22 - March 24, 2019, and passes to C2E2 2019. Garrett Popcorn goodies, Rev swag and more! OUR PACKAGING TEAM PLACED A GOLDEN TICKET (PICTURED ABOVE) INTO TWENTY-SEVEN LEAGUE OF HEROES ISSUE 5 VARIETY 12-PACKS. THE TWENTY-SEVEN 12-PACKS THAT CONTAIN A GOLDEN TICKET WILL BE RANDOMLY PLACED AT RETAILERS THROUGHOUT ILLINOIS, INDIANA, MASSACHUSETTS, MICHIGAN, NEW JERSEY, OHIO, AND WISCONSIN. ANY LUCKY FAN WHO FINDS A GOLDEN TICKET CAN REDEEM THE CHICAGO BEER EXPERIENCE WEEKEND. The Golden Ticket Sweepstakes will begin December 1, 2018 and run through February 28, 2019. How many League of Heroes Issue 5 variety 12-packs contain a winning golden ticket for the Chicago Beer Experience and passes to C2E2? Twenty-seven League of Heroes Issue 5 variety 12-packs contain a winning Golden Ticket. Will every state that League of Heroes 12-packs are available in receive a winning League of Heroes Issue 5 winning 12-pack? Didn't find a winning Golden Ticket? 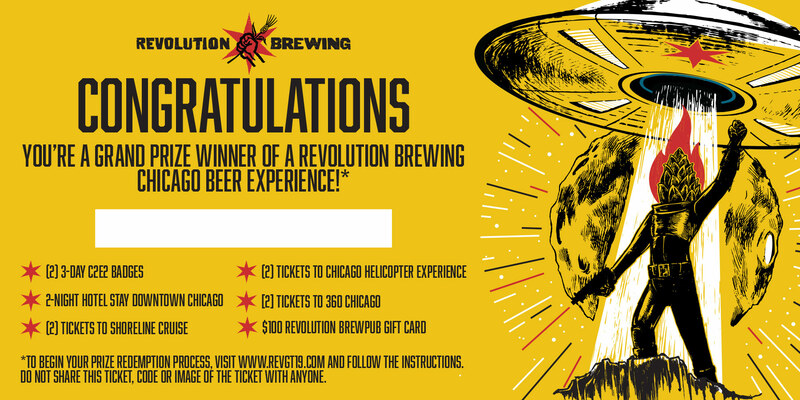 There's still a chance to win other cool Revolution Brewing Promotional Items and be entered into (1) Chicago Beer Experience Weekend raffle on February 28, 2019. Text LEAGUEOFHEROES to 24587 or visit www.RevBrewSweeps.com to enter for a chance to win. Do I have to redeem my Chicago Beer Experience package during C2E2 2019 weekend (March 22 - March 24, 2019)? Yes, all Chicago Beer Experience packages must be redeemed during C2E2 2019 weekend (March 22 - March 24, 2019). No. All Golden Tickets will be hidden in 12-packs located at our retail partners. What is the deadline to redeem? The deadline to redeem your Golden Ticket is March 4, 2019. What is the packaging date on the League of Heroes that will contain the Golden Tickets? Golden tickets will be found in 12-packs packaged on a variety of dates throughout the duration of the contest.